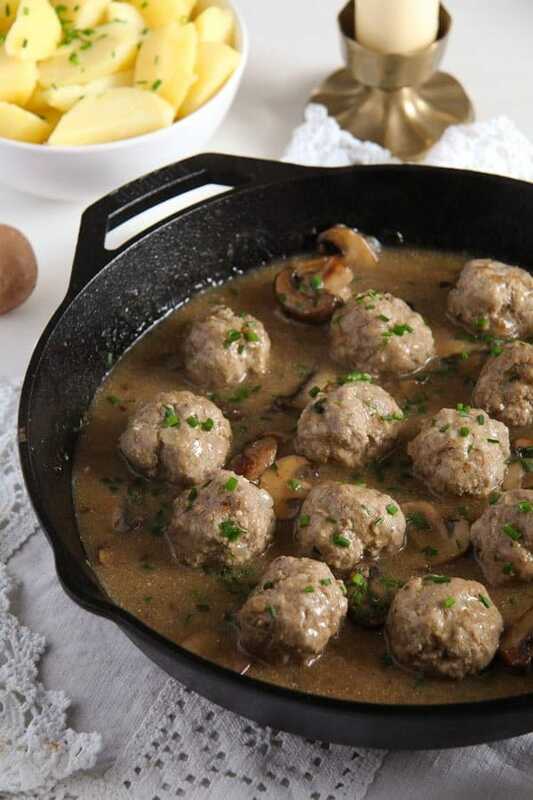 Comforting Polish meatballs in a smooth mushroom and sour cream sauce. Are you in the mood for a really comforting winter dish, something to warm you up from inside and make you feel satisfied and at peace? 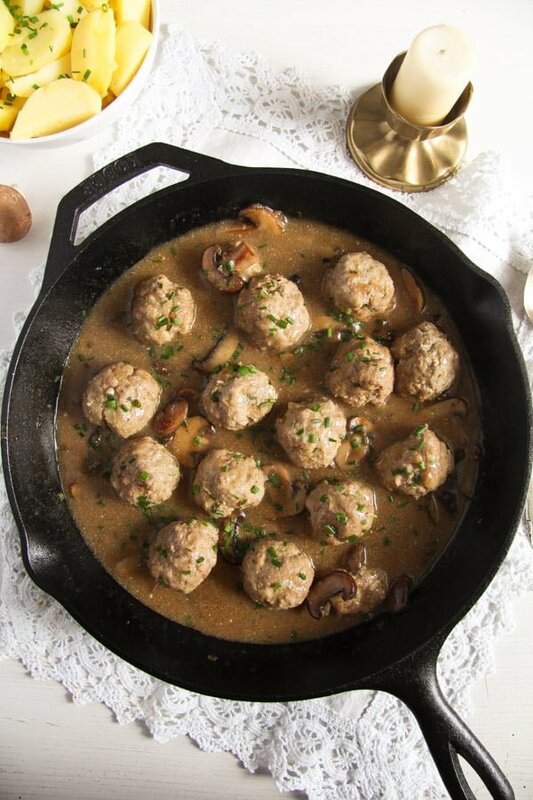 Try these delicious Polish Meatballs with Mushroom Sour Cream Gravy or any other meatball dish you might find on Where Is My Spoon, something like this Turkey Meatball and Vegetable Soup (I am so making this tomorrow, my turkey stock is simmering right now) or these other Polish Meatballs with Mushrooms, this Stewed Sauerkraut with Meat Dumplings or this German Meatballs in Caper White Sauce – Königsberger Klopse. 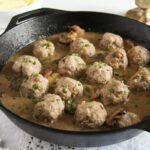 Anything with meatballs is a winner for me, I love them dearly, they are so delicate yet hearty, so comforting, so easy to change according to the mood and ingredients you happen to have, just perfect. 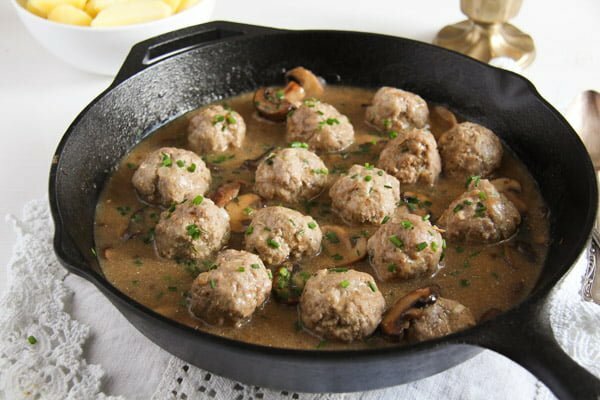 Like most meatball recipes, today’s Polish Meatballs with Mushroom Sour Cream Gravy is a very easy dish as well. 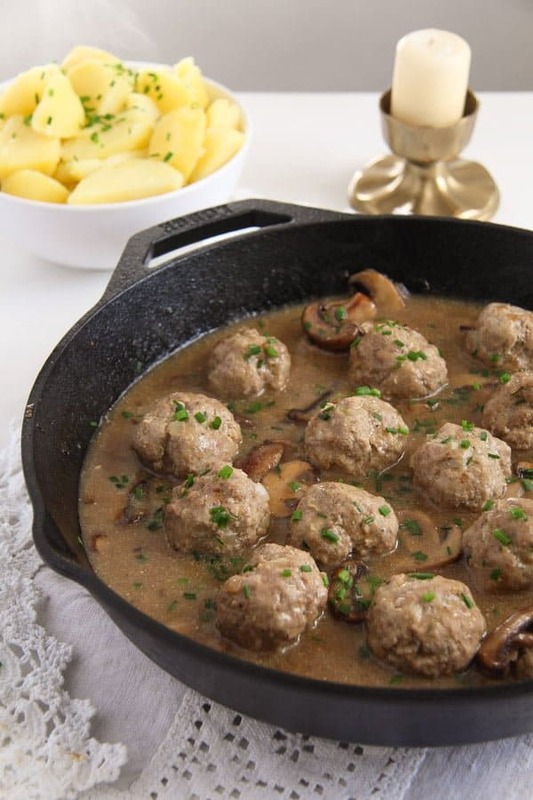 Best thing about it is that this time you don’t even have to fry or bake the meatballs, they get simmered into the broth, which will be used to make that delicious mushroom sauce later on. You can serve this dish with boiled potatoes or with noodles, the way we had it in Poland. And don’t forget the gherkins or other pickled vegetables. Otherwise, I don’t have any more words today. My daughter has scarlet fever again, so I spent most of the day fussing around her… We’re going to watch Harry Potter and the Goblet of Fire as soon as I am finished writing, I’ve promised her that and she won’t start watching it without me. My sweetheart! Saute 1 chopped onion in 1 teaspoon butter. Transfer the onion to a bowl. 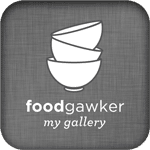 Add the ground meat, grated garlic cloves, breadcrumbs, egg, mustard, thyme or marjoram, ¾ teaspoon salt and some pepper to the onions in the bowl. Mix well with your hand. Form 15 meatballs. Wet your hands a few times in between, it will be much easier to form the balls. Bring the broth to a boil into a larger saucepan or a deeper skillet. Turn the heat down, add the meatballs, cover and simmer for 15 minutes or until the meatballs are cooked through. 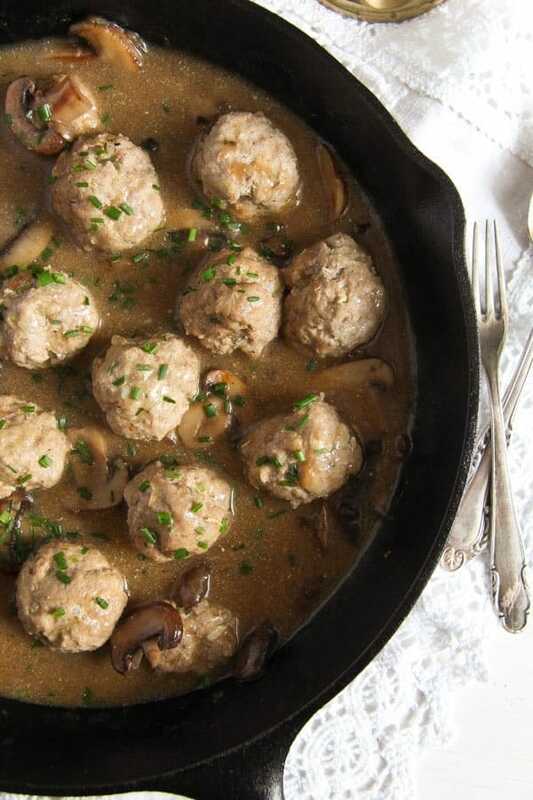 Remove the meatballs with a slotted spoon and keep them warm. Strain the liquid into another pot. Wipe the saucepan or the skillet with some kitchen paper. Melt the remaining tablespoon butter and fry the second chopped onion for about 3 minutes. In the meantime clean the mushrooms with kitchen paper and slice them. Give them to the onions in the pan and continue cooking for 3 minutes. Add about ½ cup of the reserved meatball broth, cover and cook for about 5 minutes on low heat, until the stock reduces. In a small bowl mix together the cornflour and a little water. Add the mixture to the gravy while whisking all the time to prevent the formation of clumps. Simmer for a couple of minutes until the sauce thickens slightly. If too thick, add a bit more water. Whisk in the sour cream/ smetana/ crème fraiche, adjust the taste with salt and pepper and give the meatballs to the pot as well. Cover and heat through. Sprinkle with chopped chives and serve with boiled potatoes or noodles and with gherkins or other pickled vegetables. Great recipe! Sour cream gravy, so good! Thank you and greetings. It was a lovely dish, my husband filled his plate three times, but we all go crazy for anything with meatballs in it. A fabulous recipe however I used different ingredients instead of meat. I used boiled buckwheat instead of meat and combined the lightly fried veggies (onions, garlic and mushrooms) and rest of the condiments in a food processor. I added the breadcrumbs and egg to make the buckwheat mush able to be rolled into ‘meatballs’. They were then put into boil as your recipe suggests (but for less time because all of the mush was already cooked). Took out the balls, put the in the oven to firm up and keep warm while I made the gravy. We ate the balls with cumin kraut and tabouleh. Very interesting dish. Sound like a great vegetarian alternative! Sounds like a great vegetarian alternative!